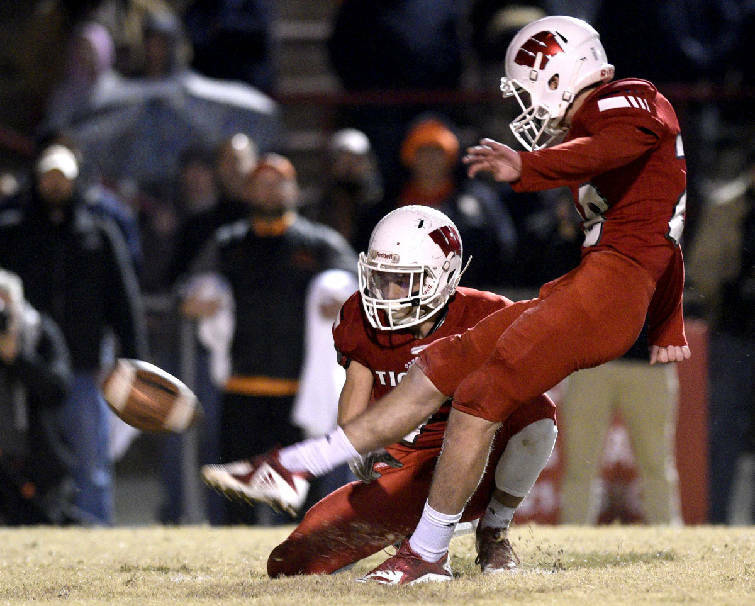 Whitwell's Evan Nunley kicks the game-winning field goal with Jaren Thames as the holder. WHITWELL, Tenn. — Whitwell High School's football team is headed to its first state championship game in program history. The Tigers edged the 2017 state champion Greenback Cherokees 24-21 Friday night in a TSSAA Class 1A semifinal and are headed to the BlueCross Bowl next Saturday at Tennessee Tech in Cookeville. Sophomore kicker Evan Nunley drilled a 27-yard field goal with just one second left on the clock for the winning points. "I saw my brother hit a game-winning kick against Trousdale last year, so I knew I wanted to meet those expectations and prove I was a better kicker," Nunley said with a smile. His deciding kick was set up by a long run by Hudson Petty, who patiently used blockers to burst downfield for a 36-yard gain. Petty had a big impact on the game, tossing a 66-yard touchdown to Tanner Stewart with 2:01 to go. Whitwell (14-0) had not led since the second quarter, staring down a 14-13 deficit since there were 22 seconds left in the first half. Petty's 2-point throw made up for a previously missed conversion and made it 21-14. "I was going to throw it to him no matter what," Petty said. "I honestly didn't see him at first, but I saw him break out of his route and tossed it up for him to go get it. "This win means so much not only to our team but our community." Petty stepped in for injured quarterback Warner Ashworth, who left on Whitwell's first scoring drive. Ashworth returned hobbled in the second half and ultimately converted a fourth-down run with a heavily taped ankle to set up Petty's long pass. "He's a warrior," Whitwell coach Randall Boldin said of his senior quarterback. "These kids are all warriors. (Josh) Wingo was banged up, Petty was banged up, but these kids don't give up. It's next man up." Petty finished with 107 yards on 15 carries and two touchdowns. He also had 105 passing yards and the touchdown throw. Wingo added 137 yards on the ground. Petty's first touchdown came on a 1-yard plunge in the opening quarter. Greenback (12-1) answered on a 6-yard run from Jalen McCord in the second quarter. Petty then ran his second touchdown in from 11 yards out. Greenback took its first lead at 14-13 with a quarterback keeper by Bryce Hanley. The teams remained in a stalemate until Petty connected with Stewart in the last period. Greenback tied it behind a touchdown run by Blake Morton with 37 ticks to go. Whitwell then marched downfield to set up Nunley's winner. "I didn't even watch it — I just watched for the crowd's reaction," Boldin said. "It feels great. This has been our goal all year." Contact Idris Garcia at sports@timesfreepress.com.